One of the biggest challenges in the western world today is staying connected to people. That challenge is hard for our church, too. There’s a new app available for every member and regular visitor of our church. 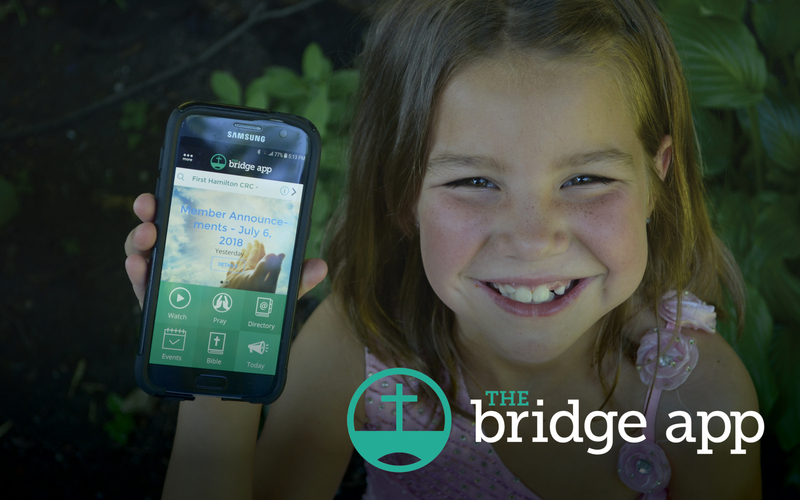 It’s called THE BRIDGE APP, and it’s available now on the Google Play store and the iOS App Store. The app is designed by the Christian Reformed Church Burlington office. There’s a live directory of all members and regular visitors, including ability to call or email directly from the app. You can also click somebody’s address and get directions right in your mapping app. This replaces the old Memberlink website that we had some years ago. You can give online to the first plate, using your credit card, and get your charitable receipt emailed to you straightaway. You can listen to our sermons on our YouTube channel, right in the app. The sermons are still on SoundCloud and in iTunes, but you can stream them in one place here. In the app. You can get our church’s weekly announcements pushed as notifications to your phone, about 1 or 2 notifications per week. You can also get immediate notifications of urgent pastoral concerns or church life matters like cancellations, funeral announcements, and more. There are other features too, including our church calendar, the TODAY book in digital form, and other good Reformed resources. Get started today! Click the icons for APP STORE or GOOGLE PLAY below to download on your Apple or Android device. Once you’ve launched the app, click CREATE ACCOUNT. And here’s the good news: if your email is already in Janice’s computer and you already get the weekly email or other email communications from our church, once you create your account you’ll automatically be verified as a member for our app. This means you can access the directory, and the personal announcements like church family news, not just the public announcements like events and programming. To be clear, you’re creating a password here—we’re not issuing passwords, you’re making one up and the system will match your email. The Bridge App is not a website that you can visit. You have to install it as an app.